Valencia is a city that never goes out of style. However, if you have some time to travel, you’ll be happy to know that the surrounding areas are also well worth visiting. 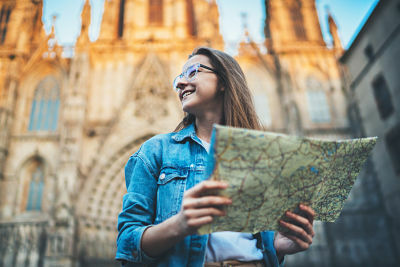 If you want to study Spanish in the quintessential Mediterranean destination, we have two words for you: ¡qué suerte! The city of Valencia is close to picturesque villages, beautiful beaches without the crowds that flock to La Malvarrosa, and traditional corners of the world with a unique charm. At don Quijote we encourage you pack a bag for the weekend, take a break from your classes, and practice your Spanish as you discover new pieces of paradise. In addition to the activities and excursions we organize at the school, we make it easy for you to travel! Our facilities in the heart of the city are just a few minutes from the main bus and train stations. With don Quijote, you have the Mediterranean at your fingertips. ¡Vamos! Looking for a typical village that will make you remember why you fell in love with Spain? If so, visiting Altea is a must. This adorable town is on the Costa Blanca (White Coast), just a three-hour bus ride from Valencia. It’s famous for its labyrinthine cobblestone streets and whitewashed walls. This year Altea has been named the Valencian Cultural Capital. While you’re here, take a moment to chat with the local artists and practice your Spanish as you admire their handicrafts on display. This city is pure heaven for palm tree lovers and Pre-Roman history buffs. 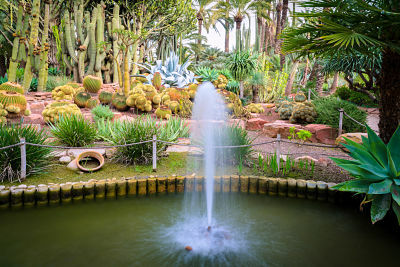 In its gardens you can get lost in the sea of trees and tropical plants that have earned Elche its distinction as a World Heritage Site. In addition to its incredible green spaces, Elche boasts centuries of history. Behind its city walls lie the secrets of many civilizations who have called it home: Iberians, Greeks, Carthaginians, Romans, Goths, and Moors, to name a few. Drop by the tourism office and pick up some pamphlets in Spanish. As you read, you’ll be learning about the history of Spain and practicing your Spanish at the same time. What a castle! 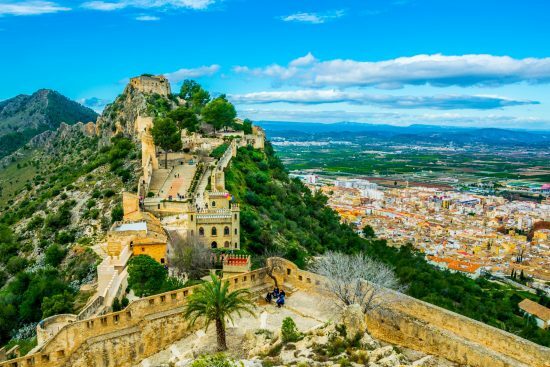 Perched atop a hill, the Castell de Xàtiva is visible from miles away. Játiva is just an hour outside Valencia, and it’s reachable by train. If you want to come completely prepared, we recommend you watch Los Borgia, a movie by Antonio Fernández, in the original Spanish version. It’s about a scheming noble family from Játiva called the House of Borja. The stories of the family’s struggle for power and involvement in plots surrounding the papacy are still very much alive in the city today. With conversations, travel brochures, and film, Spanish learning goes far beyond the classroom. Visit donquijote.org to choose the specialized course that best fits your needs and discover all the different ways to learn Spanish. ¡Te esperamos!